Botanical Name: Veronica beccabunga L.
Other Common Names: European speedwell, mouth smart, neckweed, speed-well, water pimpernel, water purslane, bäckveronika (Swedish), bachbunge (German), la becabunga (Spanish), Véronique des ruisseaux (French). Habitat: This plant is native to almost all of Europe, western and northern Asia and northern Africa, and is naturalized in eastern North America. It grows in and near streams and ditches with slow running water, wet pasture and other areas with continuous moisture. Description: Brooklime is a perennial plant with creeping rootstock (rhizome), 15-50 cm long with round, hollow and fleshy stems which can be either erect or lay flat on the ground. The leaves are oval slightly toothed, smooth and shiny. 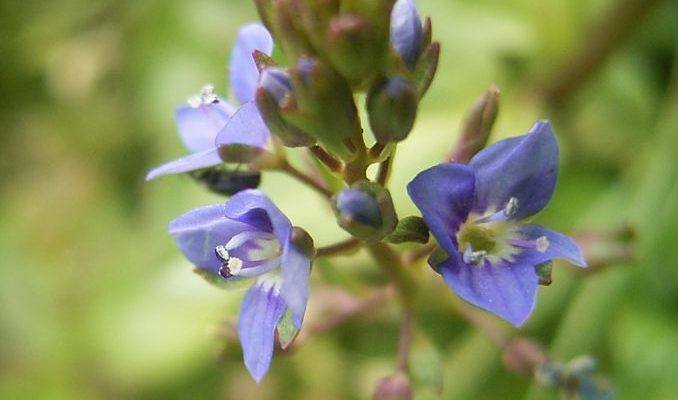 The dark blue flowers are 5-7 mm wide and sit in clusters on the leaf axils. The plant blooms in July and August. The seed capsule is almost round or sphere shaped. The horizontal sections of the stems may form roots and when the main shoot dies, the side branches give rise to new plants. Plant Parts Used: The above-ground parts are collected when the plant is in bloom. The herb is used fresh or dried. The dried herb can be used as an herbal tea, usually with other herbs. The young and fresh shoots can be eaten as a vegetable or used in a salad. The active substances found in brooklime are tannins, bitter substances such as Aucubin (an iridoid glycoside), phenolic acids, phytosterols, hydrocarbons, essential oil and some sulfur. The medical effects of this herb are considered rather weak and are thought to be mainly due to the iridoid glycosides and phenolic acids. Brooklime has very mild diuretic and laxative properties as well as a slightly fever-lowering effect. This plant is not much used these days as an herbal medicine but it has had some application in folk medicine. The herb was mentioned in the Pharmacopoeia of England and was recommended as an herbal remedy to treat scurvy and Scrofula, a form of tuberculous infection of the lymph nodes mostly in the neck. 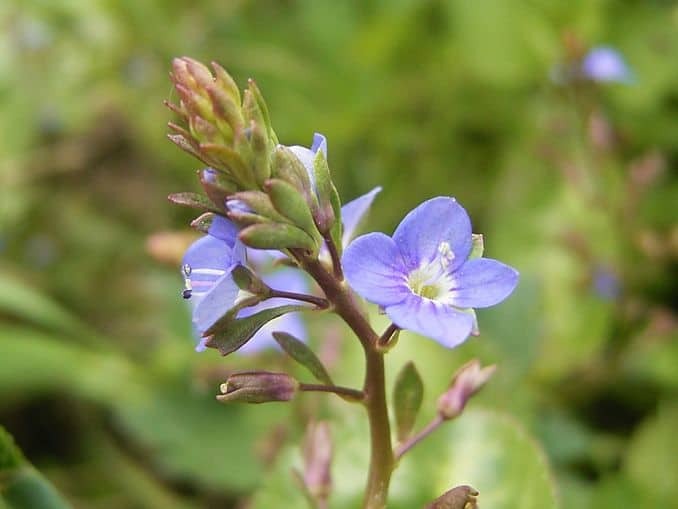 Brooklime was also used in folk medicine as a herb to ease painful urination, to treat respiratory ailments such as colds and cough, for loss of appetite, constipation, dysentery, liver ailments and hemorrhoids. In addition it has been used traditionally to treat atopic eczema, rashes, boils, burns and wounds. 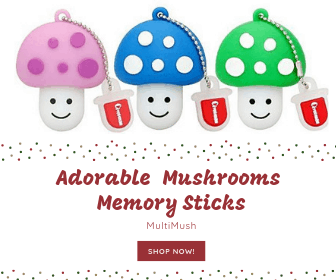 In the past, it was used in conjunction with other vitamin C-rich plants like common scurvy grass (Cochlearia officinalis), as an herbal remedy to treat scurvy, and was then eaten as a salad. If the plant grows in water which does not freeze in winter, the leaves remain green all year round and therefore it was used as a vegetable at times when there were otherwise few edible plants to find. If brooklime is intended to be used internally as a medicine some herbalists have recommended 1-2 g of the dried, crushed herb in one cup of boiling water, three times daily. There are no reports of contraindications or side effects when brooklime has been used properly in recommended doses. However, the herb should be used with caution, as it may be harmful in large doses. The plant can accumulate chromium if it is found growing on contaminated sites, and plants from such habitats must not be eaten. 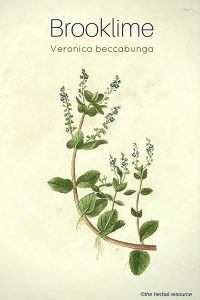 Allen, David E. & Gabrielle Hatfield: Medicinal Plants in Folk Tradition. An Ethnobotany of Britain & Ireland.Portland / Cambridge, Timber Press 2004. Hatfield, Gabrielle: Hatfield’s Herbal. London. Allen Lane 2007.